Chris VanBaalen had an outstanding start to the 2015 season, staying near the top of the points all year and earning himself a fourth place finish in the 2015 Joe's Transmission TNT Super Series. VanBaalen from Wellandport, Ontario, started strong back on Memorial Day weekend with a number two qualifier and semi-final finish on Lancaster's 1/8 mile. Then he backed that up the same weekend with a win on the 1/4 mile at Empire. The Canadian continued with multiple top five qualifying efforts and many late round appearances. He finished the season with another top five qualifier and a semi-final effort at Empire, racking up 625 points in the championship chase. "I have to thank my parents for their help," said VanBaalen. "My dad is always giving me advice whether working on the car or at the track. I also would like to thank Matt and Sherry Devries at Matt's Auto Service for everything they do to keep my car at the track running good." He added a new sponsor this year in Shawn Ellsworth at the Mac Outpost. "He gave me the computer that keeps my car dialed in. I'd also like to thank Mark Ackert at Dragnden.com for his support media wise this year." "And last but not least my girlfriend Celina. If it was not for her I would not be out racing every week. She's my biggest supporter and probably only fan. And thanks to Joe Boniferro and Ted Barnes for giving us a great series to run in." 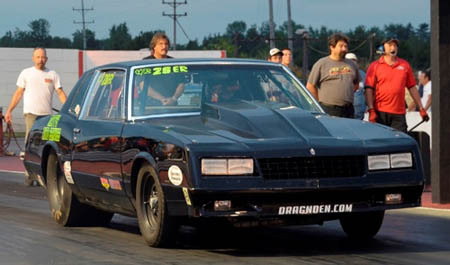 His weapon of choice is a 1986 Monte Carlo with a 509 for power running 10.18 at 132 mph on pump gas. This is VanBaalen's fifth time in the top ten and third time in the top five. 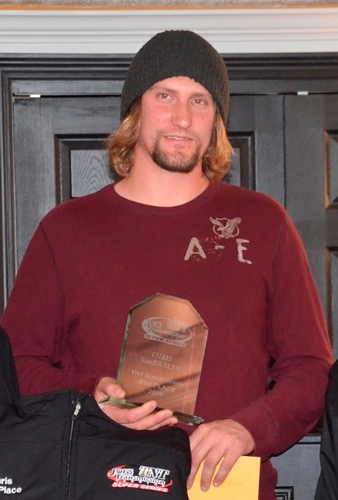 He also finished second this year in the Performance Improvements / Royal Purple DRIVER OF THE YEAR standings. For more on the most competitive sportsman drag racing series in the country and to learn how you can get involved, visit www.tntsuperseries .